She looked amazing, and everyone couldn’t stop commenting on her appearance. And those short-shorts. The year was 2005. The girl – Jessica Simpson as Daisy Duke. I had always thought she looked beautiful, but people were going on about how she’d lost weight for her latest role. As someone in the middle of yoyo’ing in her own weight, she’d caught my attention. How had she done it? By following what her trainer called the “‘Don’t Eat Crap Diet’: a South Beach Diet-style low-carb, high-protein menu of mostly grilled chicken, fish and green vegetables.” And working out 6 times a week. While I don’t remember her specific diet, I do remember focusing on, at the time, what Jessica was not eating. I watched some interview where she was talking about the things she wasn’t eating, like bread and sugar. I thought, if I can also avoid bread and sugar, maybe I too can look like Jessica Simpson? The idea of focusing on what not to eat was taken further by the popular diets at the time. Think Atkins and the whole carb restriction thing. I remember getting fixated on what I shouldn’t be eating. No bread, no dessert, no fried food. No this, no that. No no NO! I thought restriction was the solution. The whole cutting foods strategy left me…hungry. I had no idea how to eat healthy. I only knew (or foolishly thought) at the time that I should cut things from my diet. I thought restriction was the solution. Over time, I began to tell myself that being hungry was good. If I could deal with being hungry, I could one day be skinny! And I was right…ish. I did get skinny. But it wasn’t sustainable. I was so miserable. When I lost my will power to control my food, I’d gain the weight back. I’d blame my weight gain on lack of self control, instead of my ridiculous eating strategy. Then I’d cut foods again, and lose weight. And the cycle continued. It was a frustrating loop that I fully intend to never get into again. Why? Because there’s another way! Maybe I needed to go through this experience to reach one of my best resolutions – to never go hungry again. And to have one of my best ideas yet – instead of focusing on what not to eat, to focus on what I should. I changed my way of thinking and haven’t looked back yet. When I went on my initial healthy living journey, I was surprised to see that I could reduce my overall calorie intake for the day while still eating enough food to feel full. The key was choosing the right foods and slowly adding in some work outs. I love the foods I eat today. Additionally, I’m always eating until I’m content, I feel great, and I’ve maintained my initial weight loss with relative ease over the last eight years. This is why it makes me sad when I hear people say things like, “Eating healthy is hard because I’m hungry all the time!” Or, “I want to eat healthy, but I don’t like being hungry”. This is why I’ve spent the last several months developing my free 14-day healthy eating challenge, Cleanish. 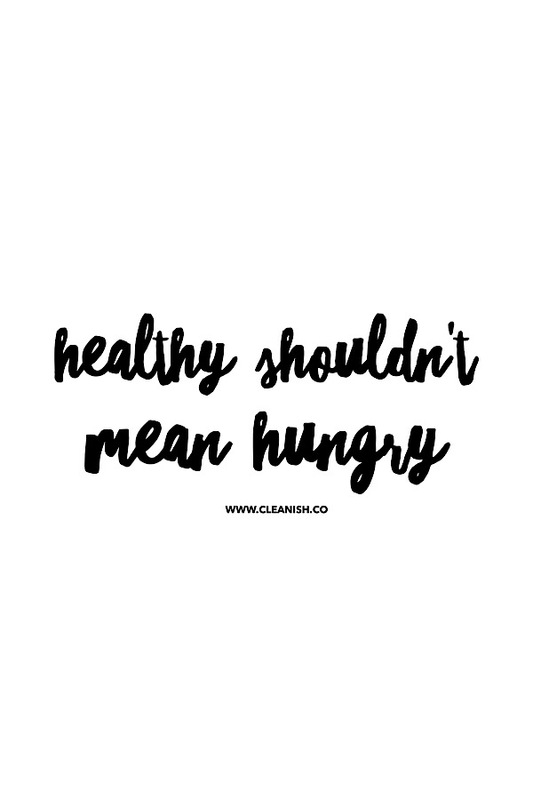 Because, in my opinion, healthy shouldn’t mean hungry. I’m sharing my tips and strategies that I use today for healthy eating in this challenge. Click here to sign up for the Cleanish Challenge. Sign-ups close this Friday, June 2, 2017 so sign up now! After sign-ups close, you can get added to a wait list for the next challenge launch. « Introducing My Free Healthy Eating Challenge: Cleanish!